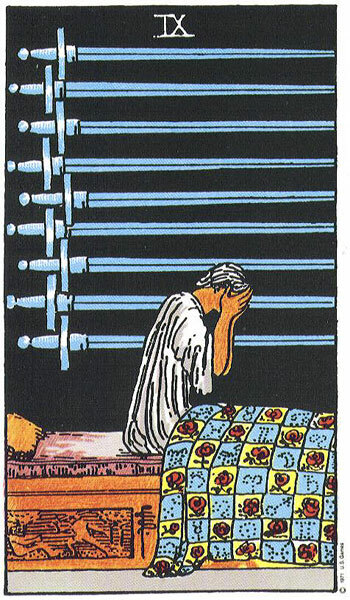 Before us lies the Nine of Swords, one of the most depressing and Dark Cards in the Tarot. Anyone happening to come upon the scene depicted, whether friend or foe, would not be able to feel upset and worried for the wretched soul in front of us. Sitting bolt upright in bed, is a woman. She has either been woken from her restless sleep or more than likely cannot sleep at all. In her feverish insomnia and obvious wild despair, she has flung back the bedspread, leaving her exposed to the cold of the night air. Beds are typically places we go to for rest, sleep, recuperation and sometimes as an escape from the stresses of the day or life. The bed the woman sits in offers no such comfort or sanctuary. She can neither lie on it or stay in it. She may have been woken from her sleep by a nightmare, harrowing thoughts or has not been able to get to sleep due to the overwhelming worries she carries with her. All those Swords are weighing heavily on her as she sits in bed. These are all the Swords she has accumulated on her journey. The Figure in the Nine looks in despair and bereft of any logical thinking. She is in a terrible state of sorrow or mourning and feels she cannot share her problems or express them properly. She cannot face anyone. We all experience restless night’s sleep at some stage or other and it is a rare person who has not suffered from the odd bout of insomnia. Some of us have busy minds that have difficulty switching off at night while others worry and stress about an incident of the day or something they have to do the next. We can twist and turn, finding it impossible to settle into a comfy position or fail to feel the waves of drowsiness descend which slip us into blissful oblivion. Generally, these periods of insomnia or disturbed night’s sleep do not last very long and generally settle down once the unsettling time has passed. We cannot expect the same when the Nine of Swords appears and this woman is most certainly not, merely restless or going through a bad patch. The woman is in complete despair. She is a mess. She sits there holding her head in her hands and is probably crying her eyes out. Something really awful or unimaginable is going on in her life or in her mind. This is not the result of miscellaneous problems of the day or the worry of attending a job interview the next. The woman’s stress and anguish is acute and heavy. The black background symbolises the bleak, dark depression that threatens to engulf her. She is all alone in her nightmare and quite possibly unreachable. The black surrounding atmosphere of this Card tells us two things. Firstly, it is night and no matter how bad we think our dilemma during the daytime, we can multiply that by ten when nighttime approaches, especially when we climb into our beds in search of sleep. During the day, there may be distractions to keep our mind off our problems, people coming and going, family to take care of, traffic on the road, work to go to or household chores to complete and even shopping to be done. However, once lights are switched out and the neighbourhood falls into silence along with our own abode, the despair and depression creeps in from every corner and surrounds us. With only the ticking of the clock and the odd creak of floor boards now and then, we have hours of empty silence ahead of us to let our mind run wild with our problems and distress. We replay the incident, issues, conversations, actions over and over in our head. Like a broken record they get caught in a loop and just go round and round, driving us mad. We try everything to take our minds off to somewhere else and remember advice in magazines and books telling us to visualise a lovely garden or beach scene and take our selves to it. With the problems this woman has, no beautiful garden or beach is going to lure her away for she is suffocating under the weight of her burden. They cannot be ignored or suppressed when The Nine of Swords appears. The darkness wraps itself around her like a damp heavy cloak. Black also represents the absence of colour and light and this is where this woman resides. She is held prisoner in the dark and windowless depths of her mind. Over her head hang Nine Swords, each and every one showing their double-edge. We have already learned that the Sword with its double edge cuts both ways. It can heal or hurt, it can be helpful or destructive. The Nine Swords represent the accumulation of this woman’s stress and torment from Ace to Nine and they weigh heavily on her. There was rarely a time when she had any respite from them throughout her journey, and now they have all come home to roost. As we stare at the Nine Swords above her, they can take on the appearance of bars in a prison cell. She is certainly a prisoner, but then again, she always has been in one sense or another. Every attempt she has made to free herself from the horrors of her predicaments have failed miserably. We must ask ourselves why? She is a Sword’s person and Swords are known to be bright, intelligent and analytical. They use their logic and reason to find solutions to any problems or difficult scenarios. They keep their head in a crisis and restore calm to chaotic situations. So why can the woman not apply these abilities and skills to her own situation? There is a very good reason for her inability to use her Swords to sever the bonds that incarcerate her. She is using the wrong side of her Sword, that is why. The side of the Sword that hurts either externally or internally is the only side she is familiar with. The woman’s problems have grown to crescendo level and there is not much more she can take. This being a Nine Card tells us that it is the end of the line for her. She either sorts herself out once and for all or collapses under the pressure and goes down. The thing is the choice is hers for she does have the other edge of the Sword to call on and work with in order to help her out of the nightmare she is living in. If she uses her mind, her natural intelligent gift, the way it was always meant to be used, then it will work with her and help her find solutions. It will also help her use another of its gift, the art of communication. This woman sits alone in the dark, consumed with fear, turned inwards, stomach clenched in knots, sweat trickling down her back. Why is it that no one is with her? Why does she have no one to comfort or soothe her with reassuring words? Someone should be holding her hand, staying with her through her dark time, cooling her fevered brow and making sure she eats but she is alone. If she is not using her Sword gift wisely, then she is not accessing its gift of communication. There is a real possibility that this woman has told no one of her depths of despair and that is worrying. She has kept her problems to herself and as a result they have multiplied and multiplied, three times over. 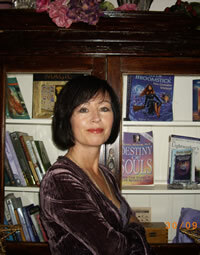 Three of the Swords in the Imagery appear to pierce her heart and head, symbolising that she is tormented on an emotional and psychological level. Once the heart and mind get entangled so, all reason and logic goes out the window and wild imaginings can take over. What persecutes this woman may be too awful to tell or impossible to put into words. Instead she alienates herself from life and those who might be in a position to help her. She remains in isolation, solitary confinement and with no one to keep her perspective in check, her mind goes further into meltdown. Looking at the Nine of Swords again, they now resemble nine steps leading up from the depths of a dark basement. This suggests that there is a way out of her predicament should she choose to take it. She has the power within her to break free from her limiting and repressive state. At the top of those basement or dungeon steps is a door, and behind that door is light and people who will help her take her problems one by one and assist her find solutions. What she is coping with is too much at this stage and mentally she is overwhelmed. She can help herself if she could just stop crying for a moment and look up. Then she will see the steps and realise that she is not trapped after all. She can then use her Swords to heal her and not hurt her. It is a choice that only she can make but we must remember that this woman has consistently had the power to help herself throughout the whole Suit. 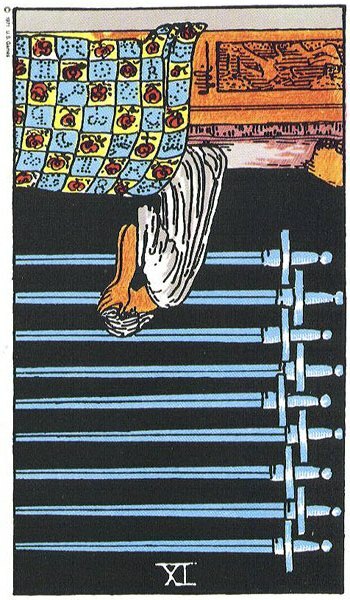 Except for her one attempt at getting help in The Four of Swords, her only other response was to try to run away from her problems in the Six of Swords. She didn’t get very far did she? The last time we encountered this woman, she was bound up with ropes, blindfolded and held prisoner by her own Swords. Nothing has really changed, even though we had hoped for so much. We had left the woman with the real hope she would realise that she could free herself if she could just make the effort and lose her fear. We had even visualised her ripping off the blindfold, tearing up the Swords and reclaiming her power. We saw her scramble up the cliff side, her newly empowered Swords clutched in hand, on her way to seek help at the castle. She had been on the run for a long time and had made several futile attempts to outrun her problems and conflict but they always seemed to catch up with her. What she was failing to understand was that the real problem, the source of all her torment and stress actually lay within and no matter how far she ran, it was always going to be there with her. So now she sits here in her bed, in her prison cell of a room, incarcerated in her dysfunctional mind. Once more she feels trapped, has no way out, and cannot bear the pain and despair that threatens to engulf her. She is suffering depression on a deep level. This is no attack of the blues or an ‘off day’ but rather a serious psychological state of mind. Yes, her mind might indeed be cracking from the pressure of it all. Perhaps she did free herself in The Eight of Swords and managed to seek sanctuary in the Castle. If she did, what sort of state did she arrive in we wonder? What had she got to say for herself when she turned up at their door shivering and mumbling with mental distress? Had they swiftly taken her in and sent for a doctor or perhaps they thought her a mad woman and sent her away? Then again, she may not have freed herself at all and was discovered by someone from the castle out walking on the beach. She may have been catatonic and collapsed when found. They would probably have called an ambulance or carried her back to the castle until help could arrive. We now wonder if they have decided to keep her in the castle, to nurse her back to health or has she been taken away to a hospital or centre that deals with her specific problems? Maybe she walked into another trap upon arrival at the castle and was swiftly thrown in the dungeons until they decided her fate. Who knows where her mind has taken her and there is also a good chance that it is only her that sees the dark black prison room around her. The colourful duvet on the bed suggests that there is warmth and comfort to be had around her. If she pulled the duvet over her instead of leaving it at the end of the bed, she may feel a little better, a little warmer, a little safer. However, this would entail making an effort to reach out and grab hold of it. Does she have it in her to do even that much? It is hard to tell. The blindfold has definitely been removed but she continues to cover her face and eyes. What is it that she is afraid to see or face. Can she not accept the truth and face the facts? She may prefer to stay in the dark for that is where she is most familiar with. She shields her eyes from the light that would require effort from her. The duvet is embroidered with signs of the zodiac and this symbolises that her dilemma is not going to be an easy fix but given time she can heal. What we must now look at is the strong possibility in the Nine of Swords that this woman indeed has very real traumatic issues to face or worry about. The Nine of Swords is known as the ‘Dark Night of The Soul’ Card and those who have had to deal with tragedy, trauma and calamity in life will recognise it only too well. 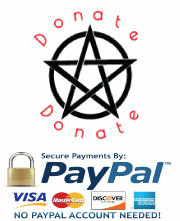 It can be a very distressing and isolating Card and has carried all kinds of terrible associations over the centuries. As discussed earlier, the woman’s problems are not everyday ones. They haunt her soul and totally consume her. To try to get inside her head and understand the extent of her suffering we may have to think about what it feels like to be waiting on the results of your scan, the scan that will tell you whether you have successfully beaten cancer or not. To know what it feels like to wake in the night and remember that you have just lost your young child to illness, accident or murder. To feel the heartbreak when you partner or spouse leaves you for another. To wonder where you will get food to feed your children tomorrow or pay the bills. The Nine of Swords often speaks of ill-health and not being strong enough to get out of bed. This woman may be battling with disease and pain. She may not be able to see a future and indeed she may already have been told she will not have one. She might try to hide her suffering from those around her, in an attempt to protect them from upset, but she really needs to open up to someone so that she can release all her thoughts and fears. Because this is a Nine Card, we must assume, the woman is coming to the end of a cycle and so in life she may be going through Menopause and all the changes it brings. She may be unable to sleep because of night sweats and hormone related insomnia. She may not be feeling well at all and is struggling to cope. It has all become too much for her. Again she needs to seek help, the right sort of help, for she may be able to relieve some of her pain. Another possible reason this woman chooses to be on her own in the dark is that she has a terrible secret held deep within. There may be nightly abuse which fills her with shame and disgust. She keeps this to herself perhaps because of her shame and the stigma attached to it or out of fear of punishment should she reveal it to anyone. She may be in a very serious situation and close to break down. Then again, the woman may have done something terrible and now has to live with the nightmare of it all. Wracked with guilt and regret, she may have hurt or killed someone in a car accident, stolen money in work and got caught or she may be facing sentencing in her cell for a crime committed. She may be hated by all and feel terrible alone. She may also be the victim of injustice and has been sentenced to jail, her white gown symbolising her innocence. She might be the victim of bullying or a hate campaign. On another level, she may be in torment over the fact that she has to tell her partner she is leaving him. The Nine of Swords for centuries has been associated with convents, monasteries, monks, priests and nuns. The Figure sitting in bed may be a holy or devoted person praying for our souls and living a life of celibacy, sacrifice and penance. The Nine of Swords tells of imagined, exaggerated and very real, serious problems. It will depend on the surrounding Cards to determine what it is that is going on. This is a Card that carries heavy weight with it and should never be ignored or dismissed in a Reading as it is often a silent cry for help. In the Nine, the Swords Suit is nearing the peak of their energy, so stress, worries and conflict may reach an unbearable level. The person in question may be in danger of a complete breakdown or worse. There would be serious concern for the Querant should other bleak Sword Cards appear and Reversed Courts, especially the Reversed Page of Swords. Because this is the Swords Suit, we must always remember that things may not be as bad as the woman is making them out to be. This may be nothing more than a continuation of the attitude and beliefs of the Eight of Swords. It may just be her perception of the situation that has been blown out of proportion. She may think things to be worse than they really are. She may be doing all this worrying for nothing. This is a problem in itself because if she is having this strong reaction to a more simplistic problem, then paranoia or manic depression may be driving it. She may be a highly strung person who makes a drama out of everything while people stand around wondering what all the fuss is about. It really depends on the surrounding Cards to determine how serious the situation really is. *When we next visit the Swords in the final stage of their journey, Card Ten, it will be with growing concern for their general well-being and state of mind. Something has to happen to free them from their misery for they cannot go on in this manner forever. It is not a life but merely an existence. Only so much stress can be taken before one snaps altogether. Let us hope it does not go that far. We shall have to wait and see. The nine of swords is certainly a bleak , dark and disturbing card taken on its own but read in conjunction with the other two cards I pulled as a quick reading for myself ( viz. the Knight of Cups and the Four of Swords) it fits in very well and explains where I am at the moment. Thank you for sharing your deep knowledge and insight. What an intense reading on the 9 of swords reversed in future position. You nailed it. Love the lost at sea analogy. Thank you. Thank you so much for your comments on The Nine of Swords Reversed. It is wonderful to get such positive feedback.